Today I'm hosting Thrifty Thursdays Link Party over at Lara's Vintage, unfortunately I didn't have any finds to show off yet this week so I thought I would just show off some of my favorite interiors today! These spaces are what I hope to create with all of the thrifty finds I've been hoarding! 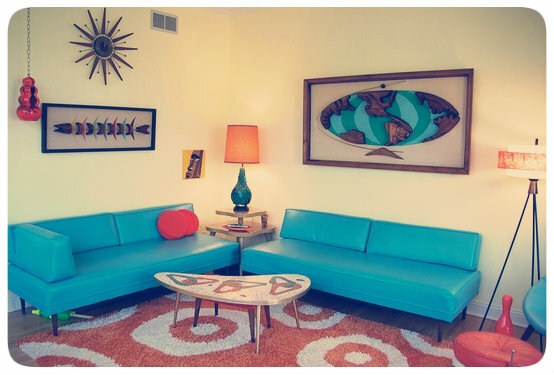 I love the bold colors and amazing decor in Mid Century homes and everything that I collect from thrifting is going towards making my own little Mid Century time capsule home. 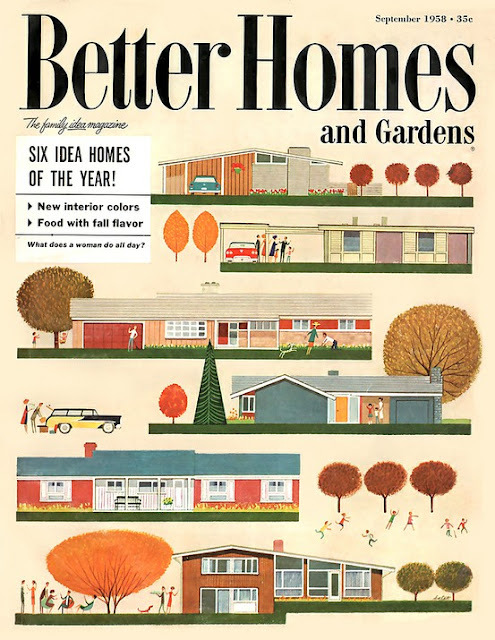 I'm so in love with the Mid Century style of this Better Homes and Gardens cover! This floral and turquoise kitchen is insane! I love the stone indoors and all the cabinet space is amazing! This atomic style living room is to die for! I especially love the globe art piece above the sofa and the boomerang coffee table is so incredible! This Mid Century living and dining room is perfect to the T! 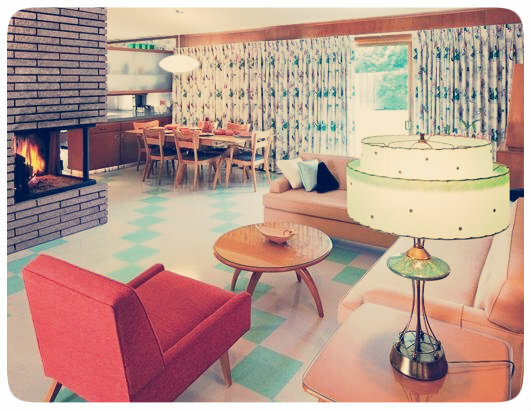 My favorite pieces are the atomic lamp, curtains, and the tiled floor! Look at the color!! 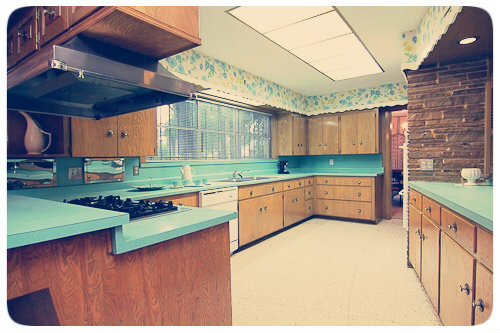 This turquoise kitchen is an absolute dream! 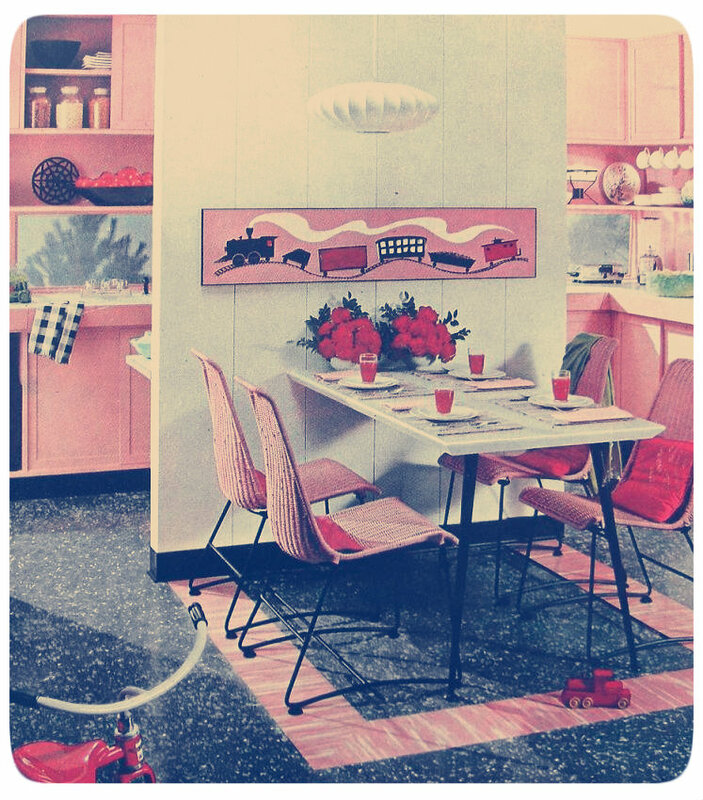 The oven is adorable, and I love how tall the ceilings are with all of that floral wallpaper! The above images I found on flickr! They are such great examples of incredible interior design. 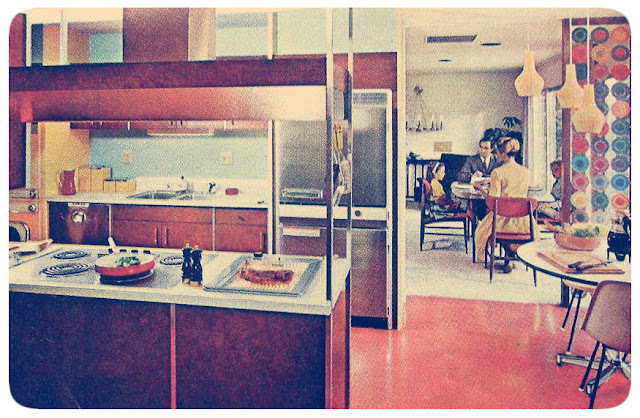 I love how much space all these kitchens have, I need to find myself an amazing Mid Century period home! What are some of your favorite things to collect when you thrift? 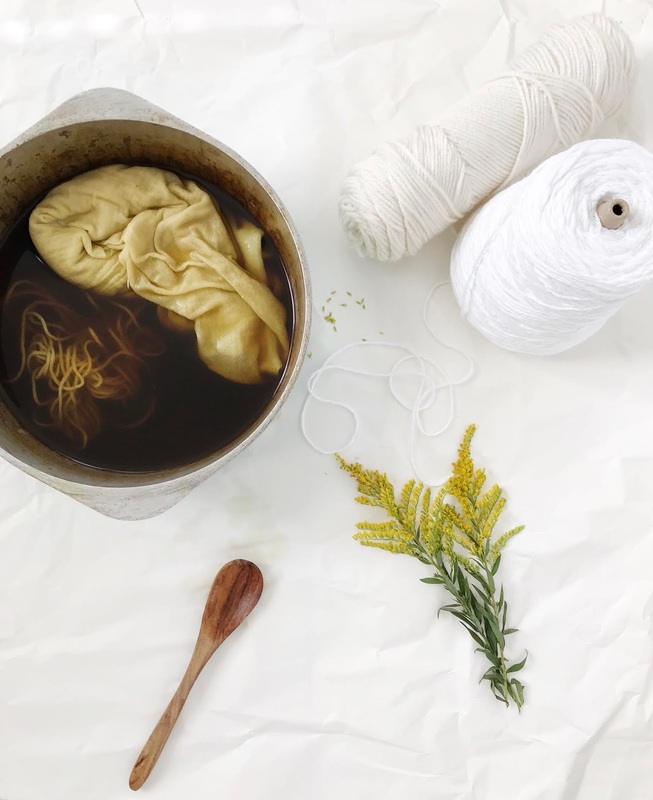 Do you thrift with a goal in mind, or buy random things that just appeal to you? Sweet Moses, i just want to pluck something out of each room and put together my dream home. Love these pictures! I do have a bloglovin, I just don't use it ever use it! I guess I should start cause I keep getting asked about it!! Amazing interiors! That turquoise kitchen is heaven. 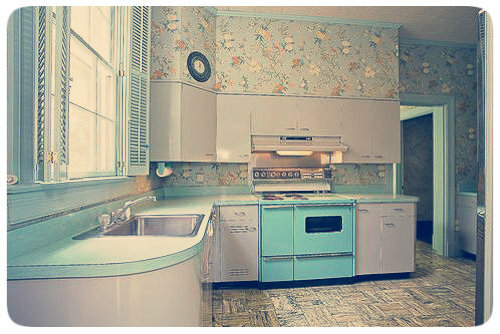 I'm now making it my lifes mission to get a turquoise oven. over the years i think i have trained my thrifting brain to look at pieces for what they could be, not for what they "are". for example, that train art in the last pic may have been designed for the kitchen but i would purchase it for a playroom or a child's bedroom. so cute. also, those high ceilings are probably the best use of wallpaper i have seen in a long time. amazing. Yea, that's exactly how I am! I used to go thrifting and find the most random things and buy them just because... And then I had a bunch of mismatched old things. After awhile I started really just pinpointing what my obsession is and now I basically just go for that. I am absolutely in love with Mid Century kitchens! There is something just so wonderfully delightful about the colors and style. I know! They don't make anythig like they used to, its a shame! Everything is so boring now! I've been looking for one of those globe art pieces for years. I saw that exact one years ago at an estate sale, but didn't get it. Any idea of who the artist or manufacturer is? It's been haunting me!